The Twin Cities ReStore can't work without help from the community. These volunteers help us to fulfill our mission and make the ReStore a great place to work and shop. Bob Kessler first became involved with Habitat for Humanity by organizing build teams among colleagues who worked for the city of St. Paul. When it came time to retire, Bob took the advice of people at his church, St. Cecilia’s, who convinced him that Habitat for Humanity was a great fit for him. He is now a regular volunteer at the ReStore, where he is responsible for a variety of marketing tasks and is the go-to-guy for procuring floor tiles. When asked what makes him stay at the ReStore, Bob doesn’t hesitate. “The staff and volunteers are absolutely wonderful.” Bob has enjoyed his time at the ReStore and hopes to continue his work there for many years to come. “I may have retired,” said ReStore volunteer Mary, “but I knew I wasn’t ready to just sit.” After a second career as a Senior Admin at TCF Bank, and a first career as the owner of her own daycare business, Mary was used to hard work. She headed to Wisconsin to help her son out. She stopped into the local ReStore to find some items for her apartment, but discovered a place that was fun to work. When she returned to Minnesota she volunteered here. “I constantly spout all things ReStore to everyone I meet,” Mary says. “I love the purpose and I love the people.” For her, ReStore is a way to stay active, and to give back to the community. Dave Minke's family has a long tradition of giving back to others. There has been at least one pastor in every generation of Minkes since his family came to the United States back in 1849. Dave says volunteering with Habitat has been a great way to give back and stay busy during his retirement. In addition to helping out at the ReStore, Dave has worked on several Twin Cities Habitat projects with his church. Volunteering comes naturally for Dave. He simply enjoys traveling around the metro helping the ReStore driver pick up donations. Warren got involved with Habitat by working on General Mills sponsored homes. After retirement, he continued to volunteer on the General Mills summer builds, plus with the GM alumni (General Mills) group that builds twice a month September through May. When he learned of the ReStore, he thought it would be another way to work with a great organization and help people. He likes the variety of tasks at the ReStore, including building and organizing display stands. He says the ReStore staff and volunteers are fun and great to work with. Warren volunteers to help others and to keep busy in retirement. He also volunteers weekly at the University of Minnesota Landscape Arboretum and at The Raptor Center at the university. 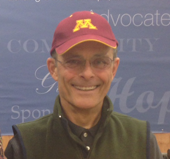 Donald was looking around the Internet for a good volunteer opportunity when he found Twin Cities Habitat. He wasn’t interested in building and repairing homes, but the ReStore looked like a place where he could spend his time and make a difference. He filled out the paperwork and he says the rest is history. He volunteers as a cashier and helps customers each Wednesday during his 4-hour shift. He says he likes that it gets him out of the house and that he’s able to help people with his time.